Watch Visions of Utopia – Now Digital or DVD! Take a community journey from your favorite couch! 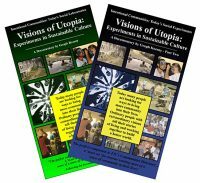 This Two-Part Video is an excellent documentary treatment of the current Intentional Communities movement in the United States. dream, their vision. Though unfortunately Geoph died before he could complete the editing of Vision of Utopia II, the FIC completed that work, with his blessing. Check out this product on our website to learn more about the movie. Scroll down the page to view several sample clips! Best of Communities: the very best articles that have appeared in Communities magazine, organized into 15 scintillating collections representing cutting-edge thinking and how-to explorations of the social, ecological, and economic aspects of sustainable living. The Communities Directory Book: the essential reference tool for those interested in finding or creating community. 1250 communities are listed, with an overview of the history and tools of shared living along with very useful articles about intentional communities.